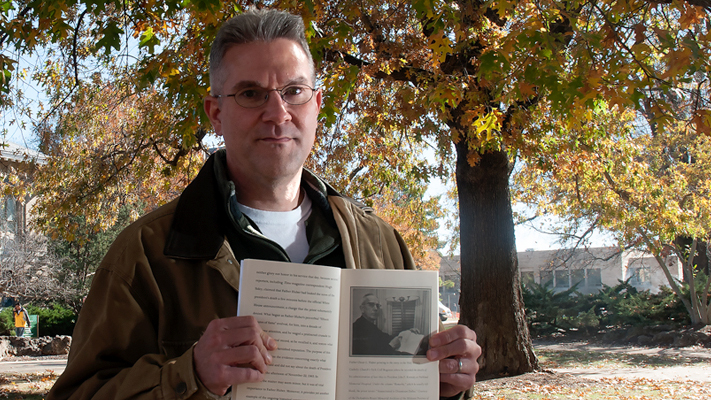 Patrick Huber shows a picture of Father Huber from his latest book, “He’s Dead All Right: Father Oscar L. Huber, the Kennedy Assassination, and the News Leak Controversy.” Photo by B.A. Rupert. On the day President John F. Kennedy was shot, Time magazine Washington correspondent Hugh Sidey, one of a group of reporters who had gathered outside Parkland Hospital in Dallas, claimed two priests left the building and one of them leaked the news of Kennedy’s death before the White House could make an official statement.